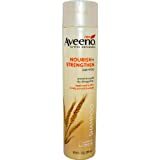 Aveeno active naturalsnourish +strengthen shampoo-10.5 oz. (311 ml) end the struggle with weak, damaged hair and indulge in silky, healthy, more manageable hair with aveeno active naturals nourish + strengthen shampoo. Infused with the power ofactive naturalsnourishing wheat complex, aveeno active naturals nourish + strengthen shampoo works with your hair’s unique chemistry to target and fortify the weakest, most damaged areas of hair, infusing them with strength, and helping to repair up to 90% of breakage in just 3 washes. Your hair will be nourished back to stronger, healthier looking, life with aveeno active naturals nourish + strengthen shampoo. Gently cleanses to help fortify fragile hair targets the weakest parts of hair to help restore over 90% of damage and reduce breakage gentle on color treated hair nourish+ nourish dry, damaged hair back to life in just 3 washes with the aveeno nourish+ hair care collection. Itsactive naturalswheat complex targets and repairs the most damaged parts of hair, for beautifully healthy hair with life. The beauty of nature + science this exclusiveactive naturalsformula, infused with nourishing wheat complex, is designed to feed your hair replenishing moisture as it zeroes in on the weakest part of hair and fortifying the hair shaft with protein where it needs it most. Developed with a team of experts, including a leading dermatologist and stylist,aveeno’s active naturals formula harnesses the power of nature combined with advanced scientific methods and is shown to give you the beautifully strong, healthy-looking hair you desire and deserve. And, because it’s from aveeno, you can trust that it’s gentle on color-treated hair.nourish+ shampoos, conditioners and leave-in treatment system. Wheat complex: what it does wheat protein has long been used in hair care products, but now the leading scientists inactive naturalsingredients development ataveeno have unlocked its true potential.